"Now I look back and feel very fortunate to have been given the opportunity to serve as a UN Volunteer with the GEF-SGP in Nicaragua. Helping local communities face challenges in their everyday lives through the implementation of projects determined by them is, in my opinion, one of the best ways to learn and gather lessons from community-level experiences. It also allows for the sharing of best practices among development aid actors, making an impact on a regional or global scale." Managua, Nicaragua: Situated in the heart of Central America, Nicaragua has a very rich biodiversity. As a developing economy, it is highly dependent on its natural resources. However, Nicaragua is one of the countries that suffers the most from the consequences of climate change. For example, farmlands are vulnerable due to extreme weather conditions which cause land degradation and severe erosion. My host programme, the GEF-SGP (Small Grants Programme funded by the Global Environmental Facility) puts a strong emphasis on helping poor communities reduce land and forest degradation through small local projects. They do so by implementing sustainable land-use management (through organic agriculture, nurseries and endangered species protection). 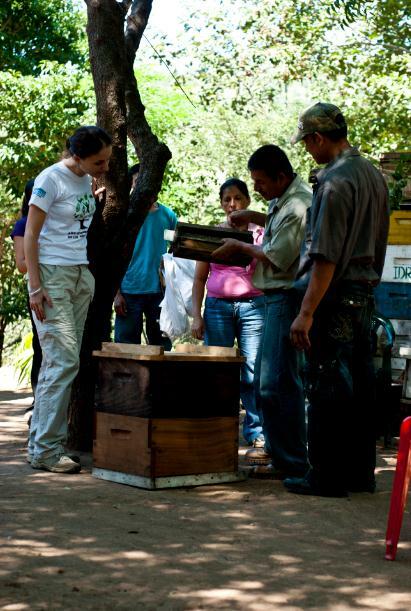 It is a way of improving the quality of life of the residents through local environmentally-friendly small businesses such as ecotourism and apiculture (beekeeping). As a UN Volunteer Intern assisting GEF-SGP in Nicaragua, my responsibilities were to help the programme in the follow-up process of projects undertaken in five different focal areas: biodiversity conservation, climate change mitigation, protection of international waters, prevention of land degradation (primarily desertification and deforestation), and elimination of persistent organic pollutants through community-based approaches. I helped community-based organizations throughout the selection process of the programme’s call for projects. Once the projects started, I was in charge of following up on their progress through the projects’ administrative management and field visits. In doing so I had the opportunity to learn a lot about different biodiversity conservation topics, such as mangrove restoration, forest protection, organic agriculture, and apiculture, among others. Another of my responsibilities was to follow up with the projects undertaken in the area of Rural and Community-based Tourism (RCT). This type of tourism involves local communities receiving - directly in their homes - tourists interested in learning about local customs and visiting the surrounding natural wealth. The GEF-SGP in Nicaragua is trying to promote this tourism alternative among communities located in areas with tourist attractions. This allows local communities to economically benefit from tourism, while raising awareness of environmental protection and the promotion of local culture. Now, as I approach the end of my contract, I look back and feel very fortunate to have been given the opportunity to serve as a UN Volunteer with the GEF-SGP in Nicaragua. Helping local communities face challenges in their everyday lives through the implementation of projects determined by them is, in my opinion, one of the best ways to learn and gather lessons from community-level experiences. It also allows for the sharing of best practices among development aid actors, making an impact on a regional or global scale.